“I’ve never classed myself as sporty or ever been interested in sport. Whilst at school I dreaded PE… especially cross country. I have never been to a gym although I do like walking and I’m always on the go while at work or at home, never staying still for long. My husband is very active and has often tried to get me involved but up until now I’ve had no interest in ‘sport’, however, I decided I wanted to improve my fitness – not to lose weight but to be toned and healthy. I’d also just moved back into the Willington area so didn’t really know anyone and when I heard about the running group being set-up, I thought it would be a good way to meet new people. I’ve now been running with ‘Willington Happy Feet’ for 6 months (since it was set up). Since joining the group 6 months ago I have never done so much, it has given me the confidence to join in the activities my husband and son wanted us to do together. We have taken part in Muddy Mayhem and the Great North 5k amongst others, these are things I would never have dreamt of doing before joining the group (and I loved every minute). I love running with my group and look forward to it every week, not just for the fitness side but also for the social interaction. I have made some great friends. I hope to challenge myself further by hopefully doing the Great North Run. I’ve also just completed a Run Leader Course so hope to help and encourage others to get involved with the running group. 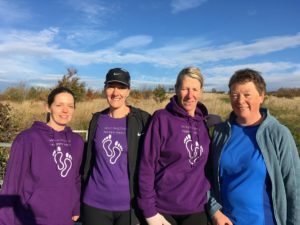 PAMELA GREEN, WILLINGTON HAPPY FEET RUN TOGETHER GROUP.